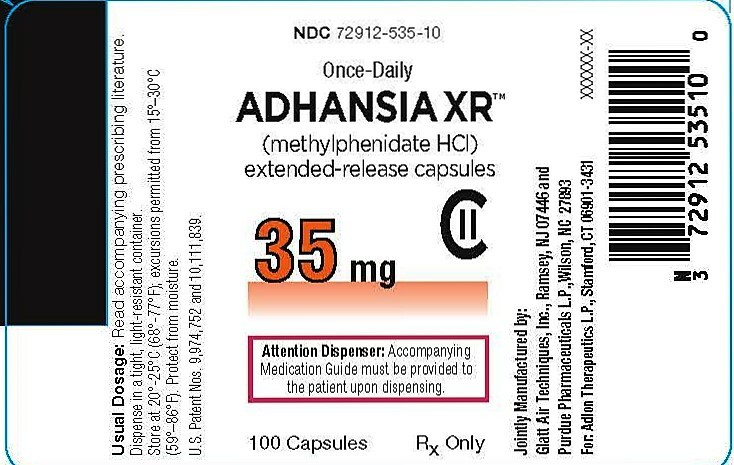 Proprietary Name: Adhansia Xr What is the Proprietary Name? 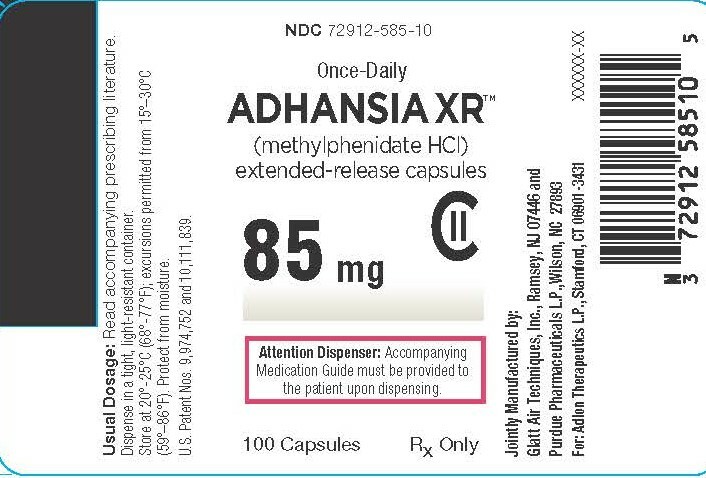 Non-Proprietary Name: Methylphenidate Hydrochloride Extented Release Capsules What is the Non-Proprietary Name? 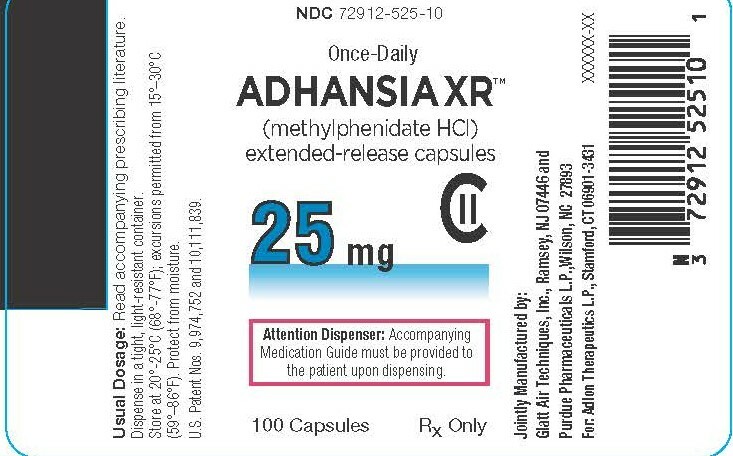 72912 - Adlon Therapeutics L.p.
Adhansia Xr with NDC 72912-570 is a a human prescription drug product labeled by Adlon Therapeutics L.p.. 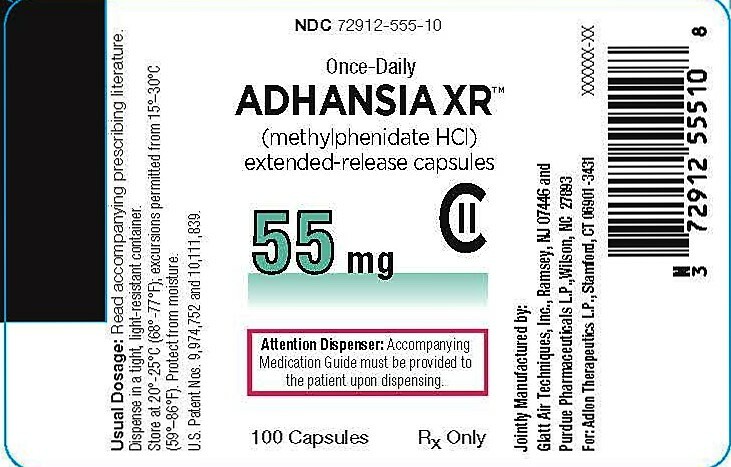 The generic name of Adhansia Xr is methylphenidate hydrochloride extented release capsules. The product's dosage form is capsule, extended release and is administered via oral form. Labeler Name: Adlon Therapeutics L.p.
FDA Application Number: NDA212038 What is the FDA Application Number? products, and amphetamines, have a high potential for abuse and dependence. in patients 6 years and older [see Clinical Studies (14)]. 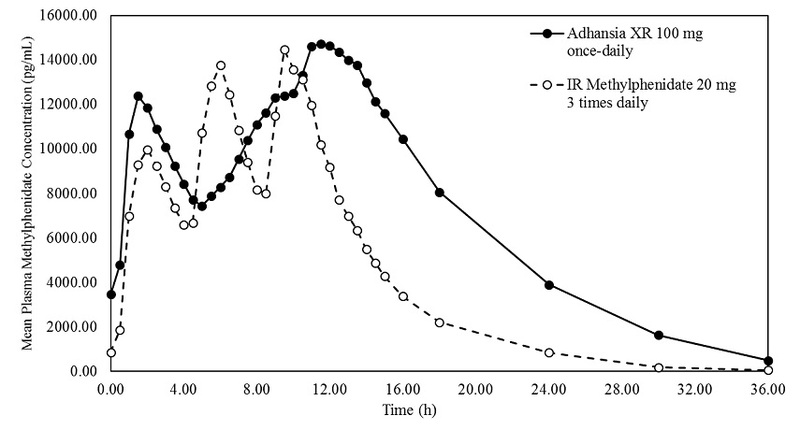 dose in increments of 10 to 15 mg at intervals of no less than 5 days. patients have not been evaluated in clinical trials and are not recommended. 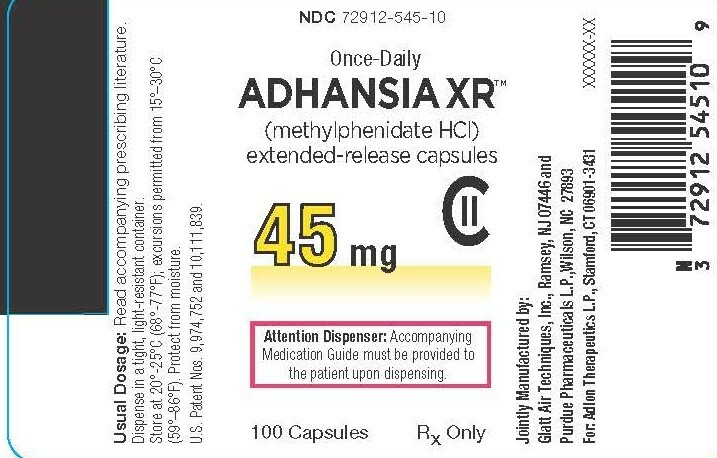 use of ADHANSIA XR, and adjust dosage as needed. on therapy [see Drug Abuse and Dependence (9.2, 9.3)]. arrhythmia, coronary artery disease, and other serious heart problems. 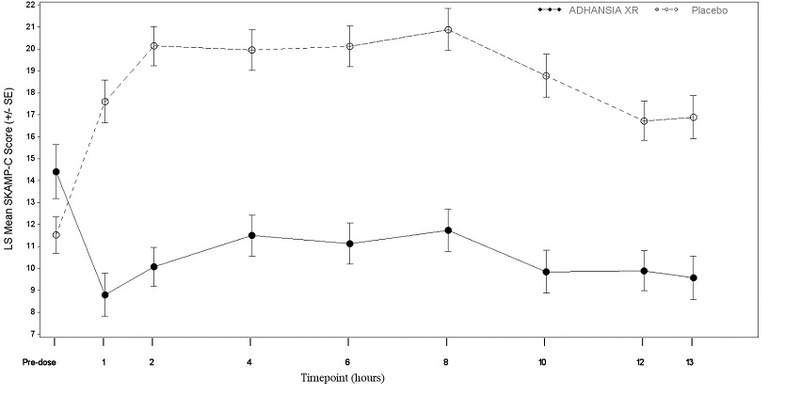 syncope, or arrhythmias during treatment during ADHANSIA XR treatment. increases. Monitor all patients for hypertension and tachycardia. or frequent and painful erections should seek immediate medical attention. as expected may need to have their treatment interrupted. due to adverse reactions compared to 0% of placebo-treated patients. to the MRHD given to adolescents on a mg/m2 basis). MRHD given to children on a mg/m2 basis). coordination, tremors, flushed skin, vomiting, and/or abdominal pain. the need for ADHANSIA XR use. dryness of mucous membranes, and rhabdomyolysis. oxygenation, and ventilation. Monitor cardiac rhythm and vital signs. Use supportive and symptomatic measures. Odorless, fine crystalline powder. Its solutions are acid to litmus. The mode of therapeutic action in ADHD is not known. of these monoamines into the extraneuronal space. 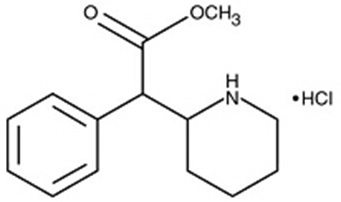 was excreted in the urine in the form of ritalinic acid metabolite. recommended human dose of 85 mg/day given to adolescents on a mg/m2 basis. the Permanent Product Measure of Performance Total (PERMP-T) score. scores, averaged across 8 timepoints on the analog classroom day. timepoint, rather than the LS mean and SE bars. Plastic bag and discard ADHANSIA XR in the household trash. Caregivers to comply with laws and regulations on drug disposal. 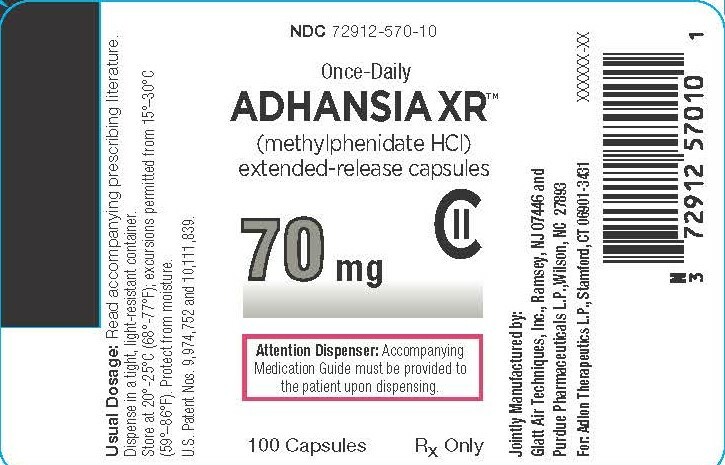 NJ 07446andPurdue Pharmaceuticals L.P.Wilson, NC 27893ADHANSIA XR™ is a trademark of Purdue Pharma L.P.U.S. ADHANSIA XR to anyone else, because it may cause death or harm them. (20°C to 25°C).Store ADHANSIA XR in a safe place, like a locked cabinet. 1-888-726-7535 or FDA at 1-800-FDA-1088 or www.fda.gov/medwatch.